⦁ Chart of accounts is the account structure that you define to fit the specific needs of your organization. ⦁ You can choose the number of account segments as well as the length, name, and order of each segment. ⦁ Accounting calendar defines the accounting year and the periods that it contains. ⦁ You can define multiple calendars and assign a different calendar to each set of books. ⦁ You select the functional currency for your set of books as well as other currencies used in reports and business transactions. ⦁ General Ledger converts monetary amounts entered in a foreign currency to functional currency equivalents by using the supplied rates. 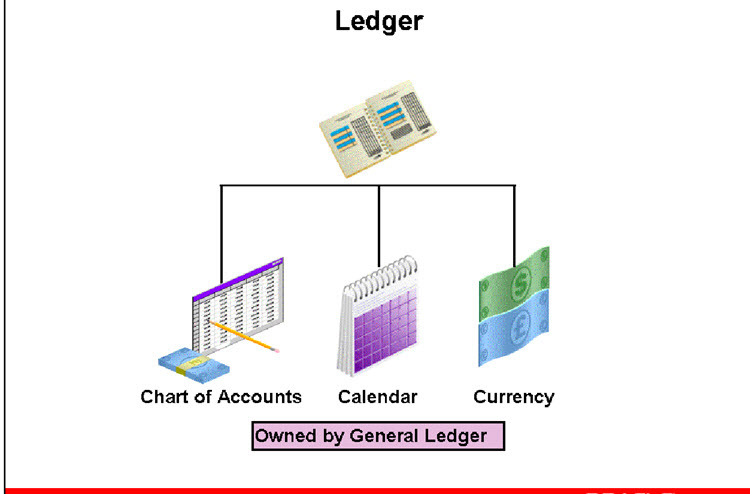 Ledger represents one of the main entities within Multiple Organizations Hierarchy. Ledger information is used by all EBS applications. Some products use currency information, others use calendar data, and still others use the chart of accounts information.